Zoe Thornbury-Phillips is a face-and-body painting artist who has won major national awards from Illusion Magazine, the UK Face and Body Art Convention, the FACE Painting Association and several festivals dedicated to the art. Zoe has worked for TV, fashion shows and photo shoots, transforming her subjects using full or partial body painting ‘makeovers’, pregnancy tummy designs, glitter temporary tattoos, UV paint and henna art. She also uses fun ideas, particularly when working with children. I asked Zoe who and what inspires her work. Leslie: Can you describe how you started and how your art has developed? Zoe: I was a creative child and studied art at school up to the age of eighteen. I first became aware of face and bodypainting when I saw Toyah Wilcox‘s make-up. I was intrigued by artists like Phylis Cohen who created the Pink Floyd Back Catalogue Album cover with five models sitting on the edge of a swimming pool. There were other artists, too, who excited me. Carolyn Cowan, who created the bodypainting in Duran Duran’s ‘Rio’ video on the yacht and Emma Cammack, who I saw doing an illusion bodypaint on Blue Peter. Then, of course Joanne Gair who painted Demi Moore for the cover of Vanity Fair. All these images settled into my psyche and it was when I went travelling in my twenties that I decided my perfect career would be as a make-up artist. I didn’t even realise you could become a face and body painter at the time but the mix of being an artist yet working with people every day made me see that would be perfect for my personality and my creative drive. I managed to be invited to spend the day with some BBC make-up artists, which was when I realised that they have to arrive before everyone else and be on call all day. They are some of the last to leave and not many of the production team actually appreciate them and the importance of their work. This did put me off so I didn’t pursue it and worked in offices and as a florist until after I’d had a child myself. I then thought my life had changed so much, why not change my career? 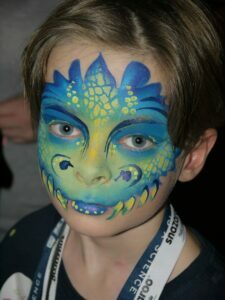 I had some connections with corporate event producers and the possibility of face painting occurred to me. So I borrowed a video from the library and bought a six pack of Grimas Face paints and taught myself the basics. Twenty years on, I am delighted that I now teach face painting and realise that being shown how to do it works so much better than watching videos. Following a few years painting children at corporate family days, parties, animal parks and restaurants, I met a corporate entertainment producer at a drinks do. He asked, “Do you do human statues?” I replied, “Yes”, and two weeks later I was finding a model, tweaking a wig, making a toga and asking lots of peers how to paint a marble effect. The agent had booked me to paint a mock garden statue at the Chelsea Flower Show which I remember having to paint in a disabled toilet! An unexpected painting location developed into a good result, as the Greek goddess posed on a box in the middle of a beautiful flower bed, fooling the guests whilst they drank their first few glasses of Champagne. 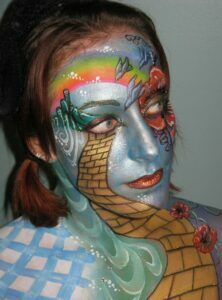 That was my first bodypaint and I have since won awards for subsequent designs and worked on many exciting projects, often collaborative, for events, advertising and PR. I do wish to do some in film as that is the only medium I haven’t painted in. I then started doing more adult face painting which has become very fashionable at parties as it makes people chat, smile and is a great ice breaker. Some of my favourite commissions are for fancy dress parties as professional facepainting can transform an average fancy dress outfit into a finished character. This can usually be achieved in minutes, which also amazes the guests at the party, when I do ‘live art’. Through meeting many other artists and working with different agencies, I have worked on music videos, fashion shows, at festivals and also painting a few well known faces such as Theo Walcott and Eddie Izzard. 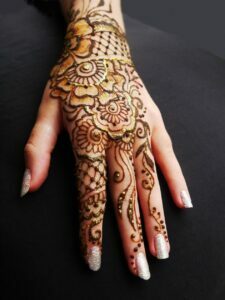 More recently I have been learning the art of henna, which I found very difficult at first. I went to some workshops and practised a great deal. It was hard to be a complete novice of an art form again, but tenacity has allowed me to add henna to my professional repertoire. It is also the lovely community of artists in my industry that have given me many wonderful opportunities over the years and have helped me challenge myself and develop my artistic skills. I embrace the variety every project offers me and love that I am still learning every day. Leslie: Where do you get your ideas from? Zoe: My ideas spring from many places. Nature is so often where I go for inspiration but also history, photographs, postcards, greetings cards, fabrics, wallpapers, plus images from books and Google. When I need to specifically design a bodypaint or something for a PR stunt or a commission, I will probably first Google the theme I need and go through images, saving any that appeal to me. Or I will look at reference books I keep on my bookshelves. I also use words and their meanings for inspiration. I will do a kind of brainstorm, listing relevant words to the theme in the sketchbook and looking at their meanings and roots. I then will mull it all over, processing the pictures and words in my head and imagining how they may fit onto the body or face. I think a lot about the design while in bed, when it’s quiet and my mind is in a place where it has more space to create. Swimming is my favourite exercise and some of my best ideas come to me when I am in the zone, doing my lengths. I have also had a lightbulb moment while riding my bike. Then I will hit the sketch book, starting with a basic outline of a body or face. Placement is one of the most impactful elements of a design and then colour and light and shade. I will have a kind of mood board and if possible practice the painting on a body. Preparation can also include creating a head dress and props, add-ons to shoes, specific eyelashes or jewels or other prosthetics etc to stick on the body. However, it can sometimes change a lot on the day as it will all depend on the body of the model booked for me. I often use models I know but sometimes you don’t get that luxury. I did a bodypainting competition in Cornwall at a historic prison called Bodmin Jail and on the way we stopped for a walk on the moor where I collected some lichen from some trees and stuck that onto my model’s shoulders as part of the design. I hadn’t been so prepared for this competition so I was sketching in the car on the journey and had finished the headdress the night before at midnight – which was made out of pizza packaging, old keys and gaffa tape. I was delighted to come second in this competition as all my life I have been told procrastination is not a good thing. 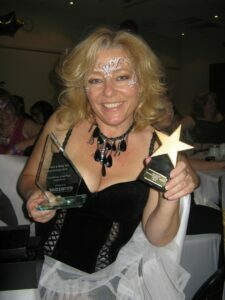 Zoe Thornbury-Phillips, UK face and body art show award winner. When I first won the ‘UK bodypainter of the year’ competition, in 2008, on the theme ‘Wild in the Jungle’ the idea of leaf-cutter ants came to me whilst swimming. I can almost remember reaching the end of the pool and it hitting me. It’s such a relief when that happens, but you can’t force it. You need to think laterally, too, so you have more chance of coming up with something original in my industry. However, in the world of face and body artists, you can just give a one word theme and 10 artists will all produce totally different paintings. It’s one of the exciting things that I love about the gatherings of face and bodypainters that keeps me going back to them. I also do a completely different kind of design process and this is when I am going to paint a person who has just arrived on my chair for some ‘live art’, as I call it. This is obviously very fast and much less analytical and ultimately the person inspires me. I exchange pleasantries whilst noticing, what they are wearing, their colouring, their jewelry and hair, their style and their personal confidence. I discovered some words recently that describe something, that I have always done but never realised that I was doing. The art of determining character or personal characteristics from the form or features of the body, especially of the face. The out ward appearance of anything, taken as offering some insight into its character. I believe I have this trait because often if someone sits in front of me and they do not know what they want me to paint, I will just freestyle. I will ask a couple of questions such as, “What reaction do you want to invoke?” Or, “Do you want to be an animal – or still you with art on your face?” Or sometimes just, “Would you like a surprise?” Generally, I am delighted to say that when their friends and family start oohing and aahing and then I show my client the mirror, invariably they will say, “That is so me, I love it!” It’s a very interesting thing to do as people’s reactions to these questions will differ so much, feeding into my fascination for people – which is really why I do what I do. I could try to be an artist using canvas or paper… but then I’d be alone and I don’t particularly like working alone, plus I am very self-critical and if my client likes my painting, even if I do not, that makes me happy and satisfied with my work. When I have asked my model the few opening questions, some kind of magic happens. I head to one colour, then another, not knowing what I am actually going to do. I stare at the contours of their face and their clothes again and then my brain just tells my hands to do things and I make up a design. Face painting that matches people’s clothes always looks amazing so that is one thing I will focus on. If they ask to be a cat, I will suggest a purple cat – if that is the colour of their shirt – and usually they will be happy. My 22 years of experience, I think, is the key to this skill and I am very grateful for it. Bodypaint by Zoe Thornbury-Phillips and Alison Bessant. Once their eyes are closed, they become my canvas but I may have to ask them to open them briefly as I want my colour choices to accentuate the eyes, as that is one of the keys to getting a wow factor with face painting. When I am bodypainting, I often ask my model not to watch me painting because then I become overly conscious of what I am doing and the model becomes a person again. I want to interact with them socially but then, when I need to, I’ll concentrate on their left shoulder or knee, thinking of their form as simply my canvas. Leslie: Who are the people who inspire your art – why them? Zoe : Other face and body artists inspire me generally. These are the images I look at most days, having lots of peers in my own business on Facebook who all have different styles and techniques. I want to be more like this artist or that one, but I generally just want to get better at what I do. 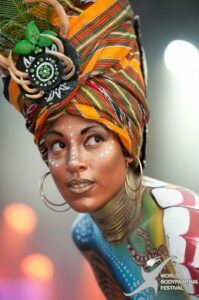 Face and Body art conventions/shows/jams usually consist of a one day or a weekend with demonstrations, workshops and competitions to enter. They’re fabulous meetings of minds that inspire me alot, to challenge myself and to make new friends, see old friends and talk shop. We look at each other’s kits and say, “Ooh, what’s that colour?” or get excited about a new paint brush or stencil we haven’t seen. Mostly we would work alone, either at events or running our business at home, so it’s a lovely opportunity to connect with the people in the industry. Invariably there is a fancy dress party within these weekends and people love to be super-creative with their outfits and really let their hair down. Often at these events guest artists from the world of face and body art industry are invited, and that’s where I have often met my heroes. Lynne Jamieson from Australia, Brian and Nick Wolfe, California, Nurit Pilchin from Israel, Matteo Arfanotti from Italy, there are so many. Of course I must mention Craig Tracy who was my most influential artist at the beginning of my career. He probably is the best and most successful bodypainter and you will probably all have seen one or two of his designs over your lifetimes. Zoe Thornbury-Phillips with competition winnings. Over the years I’ve run lots of workshops, worked with some wonderful artists and been lucky enough to both watch and lead demonstrations. Going to the World Bodypainting Festival in Austria was a highlight. It gave me such amazing inspiration and I got to see some incredible work up close which is the best way to enjoy this art. Seeing painted bodies moving, the designs and shapes changing in front of your eyes. The light of the day changes the look, as do shadows; and as a photographer your camera finds different angles and pictures with every step. The models are the unsung heroes really. Good bodypaint models (and you do see the best at the WBF) bring the designs to life and completely morph into otherworldly beings. They stretch and bend their forms to bring the best out of their artists’ work. As regards to face painting, it is the faces I paint that inspire me the most. The people who put their trust in my skills and agree to be wiped by my sponges, tickled by my brushes and wetted by my paint. Thank you to them, for putting yourself forward to be transformed and letting me adorn you with my art. I couldn’t be in this business and would get no job satisfaction without you. Next week, in COMING OUT: FULL STORY, I interview poet and author Sophia Blackwell about LGBTQI visibility in British writing today. This long, lovely and informative interview reveals so much about Zoe’s process, but it reveals even more about her passion. I was impressed by her voracious desire to learn, to improve, to broaden the scope of her art and develop her talent, and by her fearless pursuit of innovation and inspiration through contact with others. Leslie, there’s an aspect of this extraordinary art form that you didn’t touch, and that’s its ephemerality. How many writers would create a work written only in chalk on a wall? The countless hours, the effort, the feats of imagination…all fleeting. I would love to know how Zoe has been able to make her peace with this. What amazing artwork, Leslie, I am really impressed. A very interesting post. Thanks, Robbie. Yes, Zoe is a friend and she has painted Sue’s head more than once. Of course she can do that because Sue has alopecia. We’ve been delighted with the artistic results. Zoe takes great care and spends hours on her work.